Simon & Schuster, 9781982123369, 256pp. From the bestselling cookbook author and food columnist from the New York Times comes a collection of 100 menu plans featuring quick and easy dishes that can be prepared in 20 minutes so you can enjoy freshly cooked meals every day! Now there’s one less excuse for not cooking and eating right. 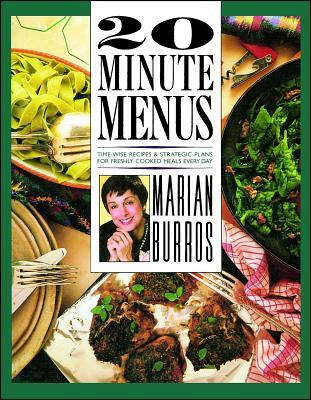 In 20-Minute Menus, bestselling author Marian Burros does all the thinking and planning for you: the 100 from-scratch menus have been designed and tested to get the best-tasting meal on the table in the least amount of time. Now anyone can put a delicious, creative, freshly prepared, and healthful meal on the table in less time than it takes for a pizza to be delivered. “If you have good-tasting, fresh, natural ingredients to start, it is possible to make special meals anytime” (Alice Waters).